In the effective treatment the teamwork and communication are as crucial as the proper medical skills, especially in acute cases. The healthcare education should be prepare the whole medical staff for these situations also. We developed more specific scenarios involving different medical fields’ representatives including nursing and paramedical staff in the same situation. 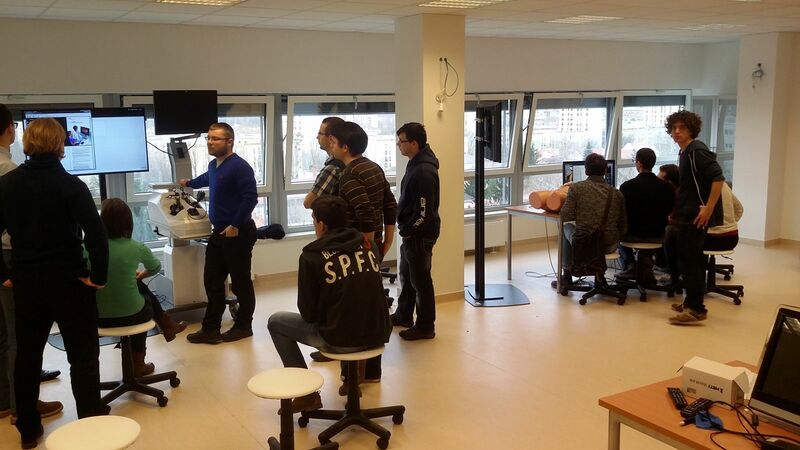 We equipped a simulation room, where the necessary simulators were available at the same time (high fidelity patient-, US-, laparoscopic simulators and audio-visual system, which was able the reach the PACS and lab-systems). Written feedback were taken after all scenario from all participant. We could perform simulations involving paramedics, emergency medicine physicians, radiologists, anaesthesiologists, laboratory medicine specialists, surgeons and nurses also. The education was mainly focused on the teamwork and communication, but performing the medical interventions were also obligatory. All of the students and instructors assessed this method effective and useful. The novel, innovative combination of the available educational technologies and equipment can provide an effective method to improve the interdisciplinary teamwork and communication improving the medical skills too, which can be a critical factor in the treatment of acute cases. The combined, multidisciplinary simulations can improve the effectivity of the patient care.